Qi Ji-guang was born into a military family and learned much from his father. He was appointed general in 1555 and won a decisive victory over the pirates at Taizhou in 1561. He worked effectively together with Yu Da-you to battle against the Japanese in Guangdong in 1563. He wrote two of the most popular works on Chinese military strategy and training, the "Substance and Discipline in Military Training" and the "New Book of Discipline and Effectiveness". His literary style is innovative: much of his work consists of colloquial records of lectures to his troops and commanders and reading them gives a feeling for his personality. The file contains the Chinese original with illustrations and English translation by Stephen Selby in parallel text (© Stephen Selby 1998). There are two illustrations. Wu Bei Yao Lue means ‘Outline of Military Preparedness’. It was written by Chen Zi-yi in 1638. One section called 'The Theory of Archery' contains some interesting woodblock illustrations. This one shows the classic Ming period position for archery on foot. The original explanations in Chinese have been translated into English. 'Guan Shi Xin Zhuan' ('Concentrating the Mind to Pierce a Flea') is a work in Chinese by Ji Jian, published in 1679. The title refers to an old story recounted in the writings of the ancient Chinese Daoist philosopher, Lie Zi, in which a famous archer improves his concentration by staring at a flea until it appears to be as big as a cartwheel. The Guan Shi Xin Zhuan is long out of print and is difficult to find. 'Guan Shi Xin Zhuan' contains some interesting and unique woodblock illustrations. Bow-hand and string-hand positions are particularly clearly shown. 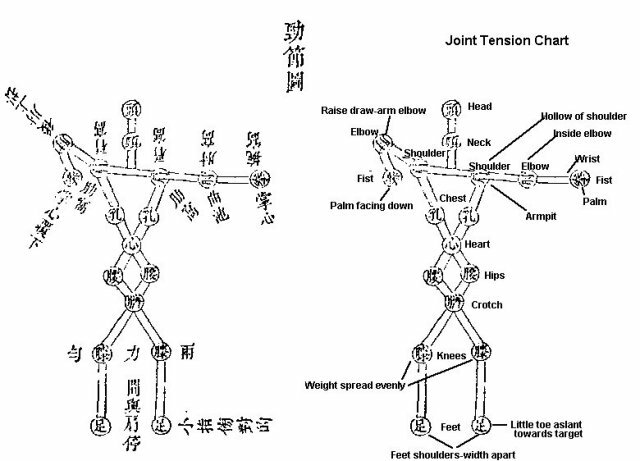 Also, there is an interesting diagram illustrating joint tension throughout the body. Only the Chinese text is available at the moment. However, we offer the English translations of some of the woodblock illustrations. The ATARN archive version reproduces a Qing Dynasty copy held in the Hua Dong Teacher's Training University, Shanghai. The text is in Adobe Acrobat .pdf format. Illustration of joint tension with English translation. 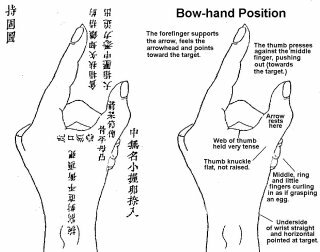 Illustration of bow-hand position with English translation. 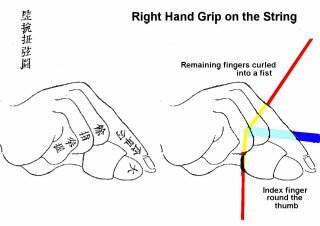 Illustration of string-hand position with English translation. Huang Bai-jia (1634 - 1704) was a student of Huang Zheng-nan, promoter of the Nei-jia school of Chinese martial arts which spread from Shaanxi to the East coast of China at the end of the 18th Century. The full text is reproduced by ATARN with a translation by Stephen Selby (© Stephen Selby 1998). There are no illustrations. 'She Lue' A previously-unpublished manuscript on archery from Beijing University Library, originally copied in 1839. Transcribed and edited by Stephen Selby. Chinese version only (150 KB .pdf file). This work follows the school of Qi Ji Guang, but includes some elaboration. 'Makiwara Madness' is a short essay by the Ming Dynasty author Gao Ying. In his 1637 archery textbook, "The True Method of Military Archery". Gao Ying devoted a centre-section in his book to 'Identifying Idiocy'. One of his themes was senseless and undisciplines shooting at the makiwara. Perfecting the Mind and the Body by Stephen Selby. An article which explores the interrelation between the study of archery, the principles of study-discipline in the 'Great Learning' ('Da Xue') of Confucius, and the practice of Qigong in the archery tradition of China (also applied to Japan and Korea.). Whistling Arrows and Arrow Whistles by Liao Wanzhen, Trans. Stephen Selby. An article specially written for ATARN by Liao Wanzhen of Beijing, China. Liao Wanzhen, who collects and studies ancient Chinese arrowheads, examines the history of two types of whistling arrow in China: those with points and those without. Cross-section Analysis of an Old Chinese Bow by Stephen Selby. Sections through an early 19th Century Chinese horn and sinew bow allow us to peek inside the workings of the bow, and we catch out the craftsman up to some dirty tricks! The Crossbows of South-West China. Stephen Selby, 1999. A study of the construction and usage of national minority crossbows in Yunnan and Guangxi. The History of Ju Yuan Hao Bowmakers of Beijing. Translation by Stephen Selby. The original author of this article is the direct descendant of the old firm. His full name has not been revealed. Chengdu Chang Xing Bowyer's Descendants Rediscovered. Translation by Stephen Selby. Original articles translated and re-published on ATARN with permission of Sichuan Commercial Daily. Interview with Wu Yonghua, daughter of the last bowyer of Chengdu, Chang Xing. Record of an interview carried out by Stephen Selby in April 2000. Some Correspondence on Repeating Crossbows. An exchange of email between ATARN members. 'Some Interesting Bows' An exchange of email between ATARN members on the Leather Wall. Chinese Bow Holsters and Quivers of the Qing Dynasty. Stephen Selby. Photographs and descriptions of three sets of Chinese quivers and bow-holsters. Chinese Horseback Archery translated for ATARN by Stephen Selby with notes by Bede Dwyer. These documents can only be read on an XML-enabled web-browser. Early Archers' Rings by Bede Dwyer. This article discusses the history of archers' rings mainly by reference to Chinese rings. Other rings are, however, discussed.